Total solar eclipse of 2017 over Oregon. The Oregon eclipse will pass over the Willamette Valley, Madras, John Day, and other areas in Oregon. Oregon eclipse. Great American Eclipse. 2017 solar eclipse. Solar eclipse 2017. 2017 eclipse. The first total solar eclipse touching the continental United States since 1979 touches down on the Oregon coast between Lincoln City and Newport at 10:15 a.m. PDT. Before Oregon, the shadow of the Moon (umbra) does not touch any other landmass or island. Click for The Oregon state page on eclipsewise.com. The site provides the most comprehensive and authoritative state pages for the 2017 eclipse. EclipseWise.com is built by Fred Espenak, retired NASA astrophysicist and the leading expert on eclipse predictions. Oregon will be one of the most popular states to view the eclipse. 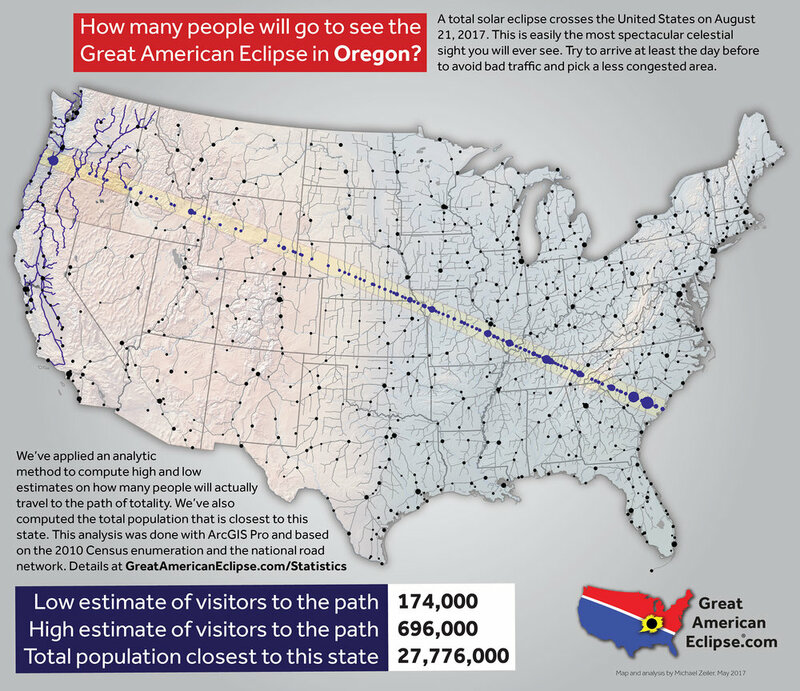 While the rest of the United States offers a longer duration of totality, sections of the eclipse path in Oregon offers the best weather prospects anywhere along the entire eclipse path. Two major viewing parties are being organized in Oregon. The Oregon Museum of Science and Industry (OMSI) has announced a viewing event at the state fairgrounds in Salem, see www.omsi.edu/eclipse-2017 for details. Another event, the Oregon SOLARFEST is being held in Madras, Oregon. See www.oregonsolarfest.com for information. Expert eclipse meteorologist Jay Anderson says on his essential website eclipsophile.com that the Willamette Valley offers a very good chance of sunshine on eclipse day and an even better forecast for sunshine in the Deschutes River Valley in the vicinity of Madras, indeed the best location anywhere along the eclipse path for clear skies in August. Although a view of the eclipse from a beach would be spectacular, avoid the Oregon coast and its summer marine layer unless the short-term weather forecast confidently predicts the absence of morning fog or cloud cover. Although Illinois and Kentucky experiences up to 40 seconds more of totality, Oregon is an exceptional choice to witness the total solar eclipse. After all, two minutes of totality is vastly better then two minutes and 40 seconds of darkened clouds! The eclipse reaches Oregon at about 10:15 a.m. PDT and exits the state at 10:27 a.m. At the coast, the greaest duration of totality is 2 minutes and as the eclipse exits Oregon, the duration of totality has increased to 2 minutes and 10 seconds. 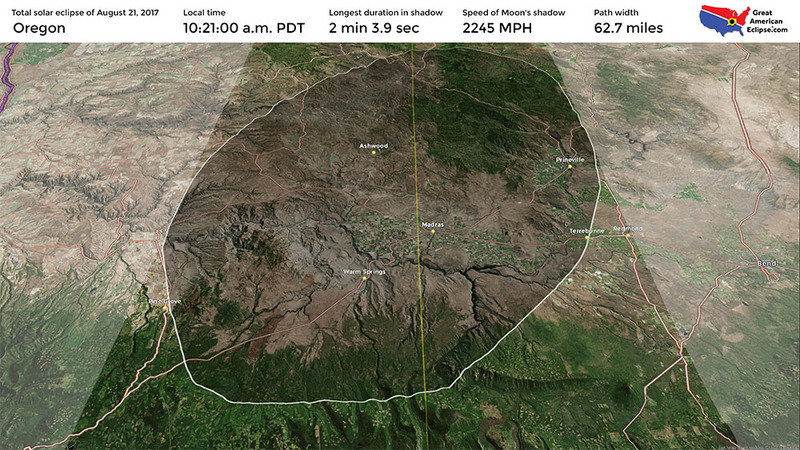 When the eclipse first touches Oregon, the Moon's shadow is racing at approximately 3,400 miles per hour! When the Moon's shadow leaves Oregon, it has slowed down to about 2,900 miles per hour because it is now higher in the sky. 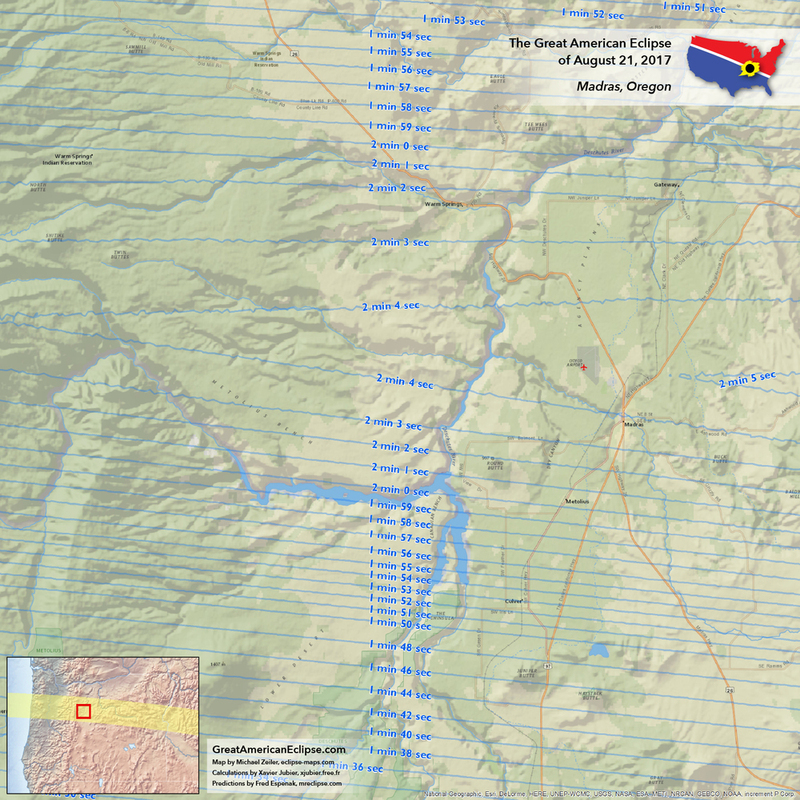 The width of the eclipse path in the Willamette Valley is about 87 miles. Strong climbers will be able to see an amazing sight from the top of Mt Jefferson at 10,479' elevation. Not only will you see totality, but also the stupendous light show of the Moon's shadow racing across the landscape. From this vantage, you will see distant places to the west darken before totality reaches you and after your two minutes of totality, you'll be able to see the landscape to the east turning dark. The risk of this tactic is that you cannot evade clouds which might develop and you would be wise to carefully study the weather forecast before starting the long hike. For accommodations, many hotels in the Willamette Valley within the eclipse path are already sold out. But given the superior highway system in the United States, a visitor can stay in Portland or Eugene and with an early start, reach an optimal location to view the eclipse by midmorning. A strategy that should work well for interior parts of Oregon such as the Deschutes River Valley is to either camp or bring a trailer or RV. Traffic, especially in the Willamette Valley and Madras, will be extreme on eclipse day. Our recommendation is to arrive at least one or two days before. If this is not possible, leave very early in the pre-dawn hours for your destination in the path of totality. More on eclipse traffic and congestion here. Finnin, Denis, “Solar eclipse as seen from Baker, Oregon, 1918, left panel in triptych, The three solar eclipses seen in the United States in 1918, 1923, and 1925, by Howard Russell Butler, 1925,” AMNH Digital Special Collections, accessed August 5, 2014, http://images.library.amnh.org/digital/items/show/24701. 99 years before 2017, Oregon was visited by another total solar eclipse with a broadly similar path from the Pacific Ocean to the Atlantic Ocean. The US Naval Observatory mounted an eclipse expedition to Baker City and this location will be revisited by the 2017 eclipse. At the 1918 total solar eclipse from Baker City, the artist Howard Russell Butler painted the Sun's corona. What you will see during totality will be similar but will far exceed what can be recorded with any photograph or painting.